Dürr Ecoclean, Wixom, MI, introduces EcoCCore solvent-based part-cleaning machines, promising to increase throughput by 30 percent compared to previous technology. The machines are equipped to provide improved cleaning performance, process reliability and energy savings, say company officials. They use non-halogenated hydrocarbons and modified alcohols to clean parts produced by machining and metalforming—wherever grease-free surfaces are required. EcoCCore machines feature two flood tanks, heat recovery, and full-flow plus bypass filtration capabilities. Users can easily switch from non-halogenated hydrocarbons to modified alcohols and back. In combination with appropriate solvents, the machines can even remove chlorinated oils from part surfaces. The work chamber holds cleaning tanks as large as 670 by 480 by 400 mm, and offers a 200-kg load weight capacity. Cycle time is less than 8 min. A major step towards improved cleaning quality lies in the new preliminary steam-degreasing process. Here, the oil-containing distillate is directed straight into the distilling system, minimizing oil deposits in the flood tank and an undesirable oil enrichment of the solvent. The result: enhanced degreasing performance particularly beneficial for parts to be coated or laser-welded. 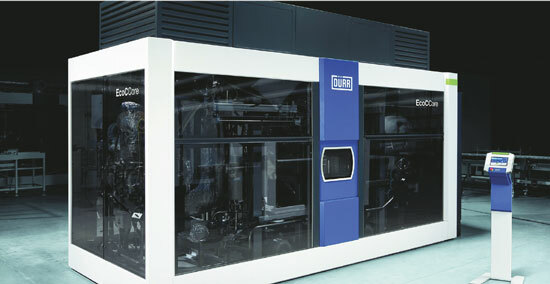 Further, the machines can simultaneously use ultrasound and filtration.